There are a few blacks that are kept in my makeup drawer no matter how many times of apartment moving I have to go through. They asked me if I could introduce them to you. Of course, it'd be my pleasure! 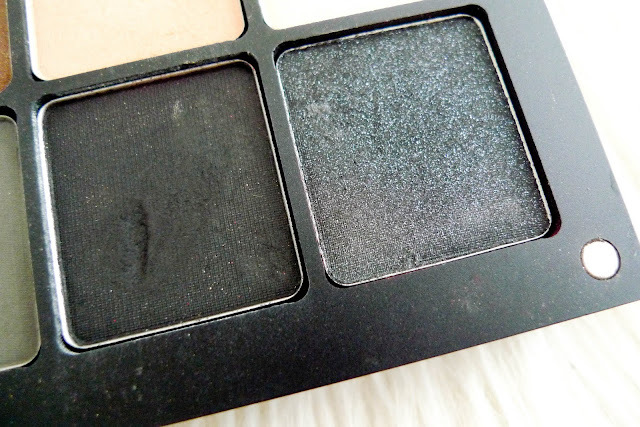 Inglot AMC 63 is a matte black. Pigmentation is smooth and intense. It is very comparable to MAC Carbon but in a much cheaper price. Despite the fallout due to the 'wetter' formula, this color is intense while very buildable. It's perfect to use for dancing the night away. 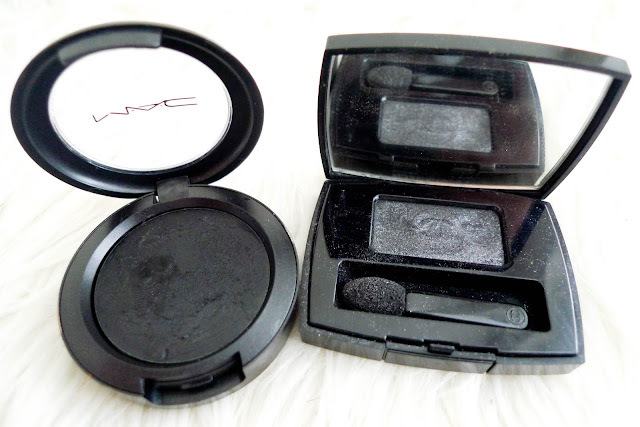 MAC Cream Color Base in Black is a ink black eyeshadow cream. Holy moly this is one intense, glossy blackest black cream thats perfect for doing smokey looks with. It can be worn alone or underneath shadows. It is easy to blend out and stays put nicely. However, it would crease easy without a primer or on oily eyelids. 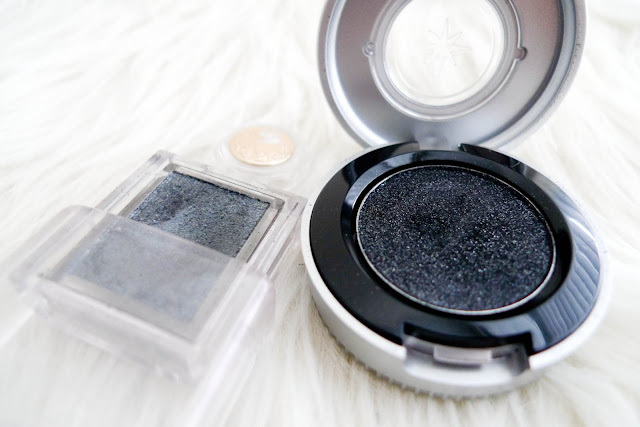 Chanel Soft Touch eyeshadow in 69 Black Star is a dark grey with micro silver shimmers. I always take this shadow with me when I go travel because it alone can create the perfect black smokey eyes. So buildable that it can transform from a dark grey to an intense black. The shimmers are so fine milled and blended so nicely with the dark grey color. So dimensional. Majolica Majorca BK922 is a metallic gray with blue, silver and green sheen and silver shimmers. Again, another shadow that I could use alone to pull off a smokey look (See my look Here). It's a tad lighter than Black Star but much more affordable. Downside? It does not last as long as other eyeshadows stated. Urban Decay Oil Slick is a dark with silver shimmers. This would be the color if you want shimmers to be seen. It has the biggest glitters among all the eyeshadows. From far away, the glitters stand out even more than the pigmentation of the eyeshadow. 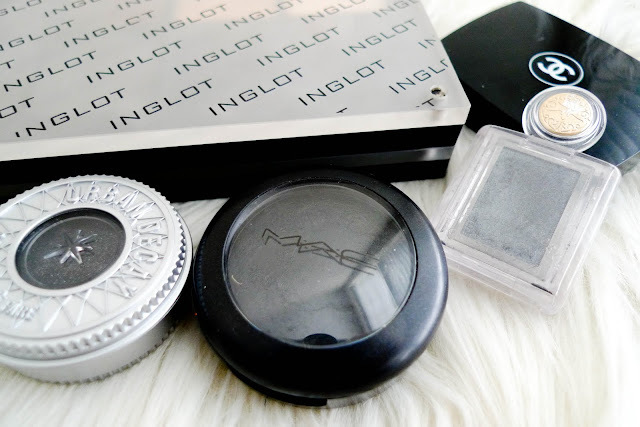 Inglot AMC 65 is a black with micro silver shimmers. This understated shimmery black is my favourite alternative when I am sick of using a matte black but still want that intense black color. It's smooth, pigmented and lasts a long time. 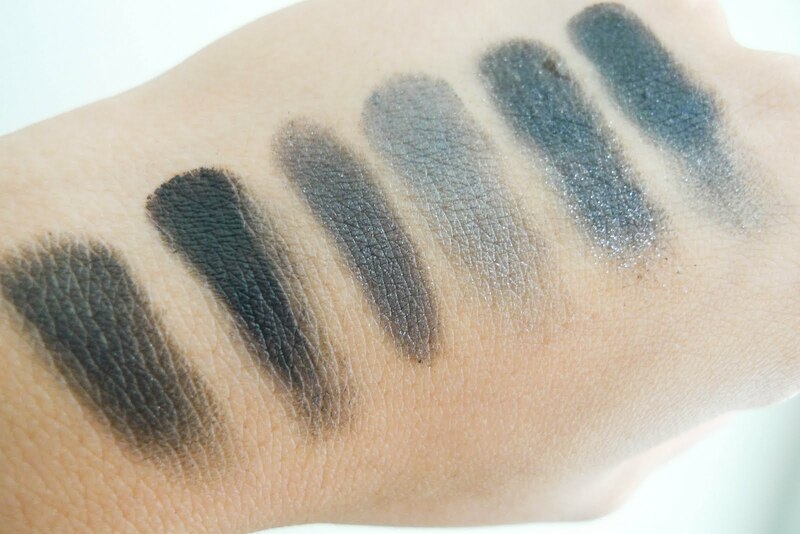 Do you constantly grab for black eyeshadows? What are your favourites? Please do share! I blog quite often and I truly thank you ffor your content. for new information about once perr week. I subscribbed to your Feed as well.